The Glock 43 Gen 4 is a 6 round, 9mm slimline subcompact pistol that was introduced in mid 2015. It is the perfect concealed carry handgun and is extremely popular with Law Enforcement as a back up and off duty weapon. Firearms must be shipped via Fedex Overnight, to your selected FFL. This is a flat rate, $40 charge which includes insurance. Please Note: The Glock 43 is currently not available for sale in California except to active duty Law Enforcement officers. 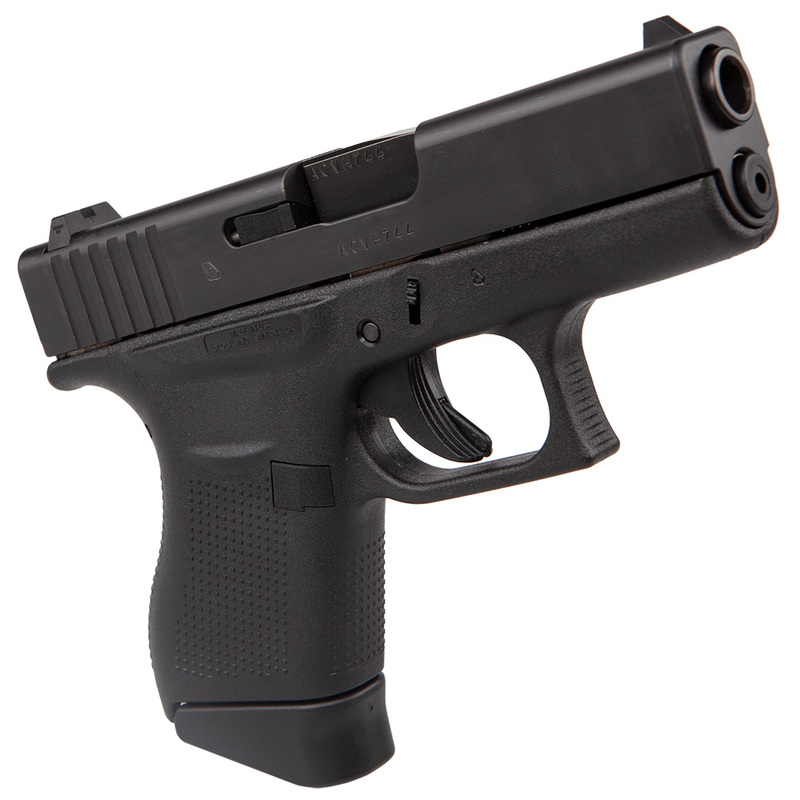 The G43 is a 9mm, slimline, single stack, subcompact pistol engineered with the GLOCK Perfection promise and able to withstand the rigors of concealed carry and daily training. Made in the USA, the G43 is the smallest 9mm GLOCK has ever introduced, making it an ideal back-up or concealment gun for civilians and Law Enforcement alike. No discounts are available on the purchase of Glock factory handguns. Discounts, when available, will only apply to accessories and parts. NOTE: FFL required for shipment. If you do not have a dealer in mind we can help you find one in your area. If you do have a dealer selected, please note which FFL will be receiving this item in the Comment box during checkout. Failure to do so could delay your order processing and shipping. If your FFL is not already on file, have them fax a signed copy of their license to 858-569-0505 and include your name and order number on the cover sheet. Attilla the Hun was only 5 feet 2 inches tall, and Napoleon not much bigger. Although they are considered diminutive in size, they both had big attitudes and got a lot done in a short period of time. The Glock 43 is along the same lines. It isn't very big, but it feels great in the hand - and I have a decent sized hand. It points like a Glock should, it is solid in it's feel and with the right ammo is a very good defensive handgun. The only thing I added were Pearce magazine extensions for a better grip. I don't like having my pinkie finger hanging over the edge of the grip. That said, this is one very cool handgun - quick handling and tough. I intend to buy another one in a couple of paychecks. The 43 is a very sound investment for anyone looking for an easy handling concealed carry gun with good punch to it. Even though I'm an old dog, I do try to teach myself new tricks from time to time, especially when it comes to practical, effective personal defense. I ordered a 43 2 weeks ago and will be ordering another very shortly. The design is amazing. I have a fairly large hand, but the 43 fills it more than adequately. Also, everything I've recently read says that the 9mm round can hold it's own with the .45 and the .40. Furthermore, ballistics have come a very long way in the past 30 years. Modern bullet design and propellants have increased the power of the 9mm, making it a far more effective round that it was. I have always gone with a .45, but I really like what I read and see about the 9. But don't take my word for it. Do the research yourself and make your own decision. This old dog will be ordering another Glock 43 very shortly. Glock got it right with this one it is going to be perfect concealed carry weapon. LOVE! this gun. I usually don't spend time writing reviews but I'm happy to make an effort to express my satisfaction with the Glick 43. I picked this gun for the size and reliability and I haven't been disappointed. ive been impressed with how easy to conceal on my thinner frame and how easily accurate it is for me to shoot. I got teased for getting a nine single stack at first, but now they are envious of how lite weight and easily concealable this gun is compare to the bigger models. I recently added a crimson trace green laser and aftermarket finger extensions. I highly recommend this pistol as an everyday carry for its ability to comfortably ride on you hip, lower back, or pocket all day long. And come on, it's a Glock so you got the reliability and confidence it's gonna perform when needed. I Owned one of these guns it was my first glock and I had to sell it!!! Have regretted it ever since. I now own a glock 27 40 caliber. But now going to buy a gen 5 model may even get another glock 43 such great quality guns. I purchased this gun back when it was first released. Have shot many rounds threw this gun and carry it often. I have made some improvements to the gun as well only because I like tactical guns. This particular Glock is one of my favorite weapons that I carry a lot. Must admit it is a great shooter and great for conceal carry. If you like Glocks in caliber 9mm give it a try. I just bought it never owned one, I have friend who owns one which 40 Caliber. I went with the 43 9mm absolutely love it very accurate plus lightweight, easy to conceal. Thank you Glock extremely happy. Great gun just wish it had extra safety. Just purchased New Glock 43 last week for a more concealable weapon. I was a bit skeptical because of its diminutive size but was blown away after the first 18 rounds fired through it. My spread at 50 feet was about 14 inches in diameter of center target. It’s a little snappy but easy to adjust to. My Glock 19 feels like a bazooka in size compared to Glock 43. This thing is a winner and well worth the investment and conceals very nicely. This Gun Has It All! It just doesn't get any better than this. I have always been a compact fan - I started by carrying the Sig 238 (.380) because no one made a proper 9mm compact. I switched briefly to the Glock 42 but went back to Sig when they introduced the 938 (9mm). FINALLY Glock got with the program and introduced the G43 in 2015... and I haven't looked back since! This little gun simply has it all. Although I am clearly a Glock-0-Phile, as a professional firearms instructor I try not to show bias to my students. Regardless, I have ordered dozens of these for students looking for their own EDC gun and who fell in love with the G43 they shot - among others - in class. You simply can't go wrong here.